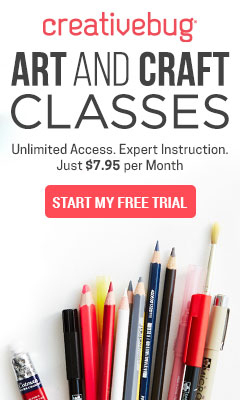 Well, CreativeBug is an award-winning online arts and craft learning site offering unlimited access to take beginner-to-advanced yarn crafting classes in everything from knitting and crochet to weaving and needle felting, as well as hundreds more across other crafting mediums. Additionally, it now provides its users with lifetime access to the classes that mean the most to them, whether they maintain an ongoing subscription or not. It’s simple. For every month someone subscribes, they receive a token to save one class of their choice to their personal library. These classes never expire, even if the user cancels their subscription. For less than $5 per month you can now hone your skills while learning from and being inspired by top crochet and knitwear designers – like Marly Bird, Norah Gaughan and Wendy Bernard – and build their your special collection of classes with lifetime access. Marly’s newest class with Creativebug is a Crochet Shawl Workshop that includes lessons on how to crochet 3 uniquely different shawls. Get the class today and have a shawl completed by the end of the weekend! For me making or crafting has been a way of life since I was a child. With grandmothers and a mother that did various crafts it was inevitable that I would also doing various forms of needlework and other crafting. For me it is a lifeline, it centers me, and gives me great pleasure. I often say it is the journey not the finished object that is most important.